"If it bleeds it leads." "15 minutes" is a title way too small for its film -- like a cork meant to damn the Nile. This is the most intense production of the year. "Hannibal" scary? Forget it -- comparatively speaking. Director John Herzfeld brews up a fervent stew of hard as brass conflict, gruesome homicides, tasteful sprinkles of humor, rock solid dialogue, tight-as-gears direction, solid performances, grinding sound track, and whirling cinematography. Powerful, simply powerful. Unfortunately, a few implausibles abate the punch - but not enough to stop this rumbling steamroller of a film. Never a dull, boring moment - ever. Two Europeans thugs come to the States to collect their money from a fellow thief and comrade. When they learn he's spent it all, the mean thug kills the friend with a kitchen knife while the Hollywood-loving thug videotapes the murder. It's gruesome and it's vile and it's angry. This film is not for the weak of stomach. Realizing that the friend's wife witnessed the crime, the mean one kills her too. Again the somewhat comedic Capra-wannabee tapes. Here lies the first implausibility. That mean thug would smash that camera against the wall -- this would be consistent with his rage and motivation to destroy all evidence of his crime. A smashed camera wouldn't have effected the play of the rest of the story. Those are the two bad boys; the good guys have a duo of their own. Bobby De Niro laps up the press as poster cop and "friend" of "Top Story" TV tabloid host Kelsey Grammer. Edward Burns plays a crackerjack Arson Investigator - a fireman with a gun. The give and take between this cop and firefighter team splendidly constructs the spine, heart and soul of the film. A second implausibility arises when the two bad guys begin to argue over ownership of their master plan. It's conceivable of course that this would happen, but the manifestation and timing of the event rides an altogether different grain from the rest their interplay. Both thugs are strong performers. "You think I came to America to work?" When the mean thug delivers that line ... you just know he's not very well tempered. 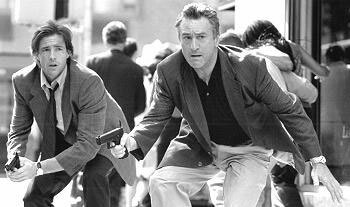 De Niro endears the viewer to his character by first teasing, then assisting his unlikely partner, "You remind me of a puppy I used to have." His prep for a proposal moment further cements our sympathies ... however the actual proposal scene plays prominently cliche in this gritty original film. "15 Minutes" starts out like an independent picture, but eventually explodes into an all out Hollywood production that takes you up with it and slams you down. Excellent dynamics and direction ... this film will do very well at the box office. 15 Minutes. Copyright © 2001. Rated R.
Starring Robert De Niro, Edward Burns, Kelsey Grammer, Avery Brooks, Melina Kanakaredes, Karel Roden, Oleg Taktarov, Vera Farmiga, John DiResta, James Handy, Darius McCrary. Written by Directed by John Herzfeld. Produced by David Blocker and John Herzfeld at Industry/New Redemption/Tribeca a New Line Presentation.